Beira in Mozambique, one of the areas worst hit by the cyclone, has been set up with a centre for waterborne diseases. Photo: Mike Hutchings/Reuters via Al Jazeera. 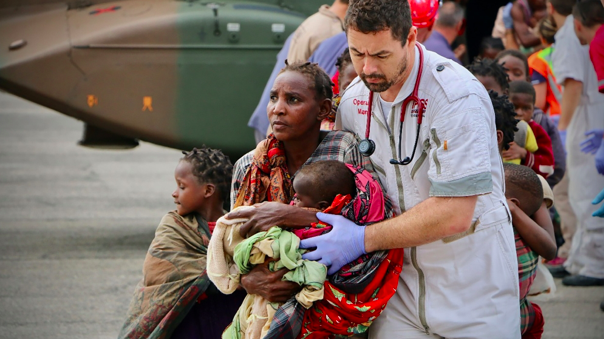 Mozambique alone has approximately 1.7 million people that have been affected by the storm and are in desperate need of aid. The UN says over the next three months it will need nearly 300 million dollars in aid to help these cyclone victims. In central Mozambique, a coastal country in West Africa, it was harvest season before the cyclone wiped out most of the crops. The cyclone likewise destroyed many homes across the country. Many survivors are living in tents, schools, churches, and other impromptu places for shelter. Many are left with little besides their clothes. The mayor of Beira, Daviz Simango, said that “there is no food” in Beira. Right now, there is fear of what some are calling a “second disaster” in Mozambique from cholera and other diseases like Malaria. On Friday March 29, the number of confirmed cases of cholera in Beira jumped from 5 to 138, despite efforts from the government and aid agencies trying to contain the spread of the bacterial disease which causes severe diarrhea and dehydration. Cholera is usually spread from contaminated drinking water. Aid workers are escorting people to safety at the airport of the city of Beira in central Mozambique. Photo:Adrien Barbier/AFP via Al Jazeera. The World Health Organization is sending 900,000 doses of the oral cholera vaccine from a global stockpile to the areas affected by the cyclone. There is also a fear of the number of malaria cases increasing due to the fact that mosquitos breed in standing water. Mozambique’s National Disaster Management Institute said that the death toll from the tropical storm in the country had increased from 468 to 498. As of Saturday, the number killed was up to 105 and 1,523 people were injured. The total death toll is estimated to be 746 people with many still missing. This number includes the approximately 259 people who died in Zimbabwe and 60 that also died in Malawi. Zimbabwe, although less affected by the threat of disease, had large tracts of agricultural land destroyed by flash floods and landslides triggered by Cyclone Idai. In a country with food insecurity, this has only deepened the food crisis and caused fear among farmers about their livelihoods.